Situated in a quiet valley this is the ideal base for guests looking to relax and unwind in the splendour of the beautiful Somerset countryside. Nearby are some of the most popular and fascinating spots in the South West including the spa city of Bath with its classical architecture and wealth of history the metropolitan city of Bristol with its array of shops and restaurants and Wells the smallest city in England. The picturesque scenery and caves of Cheddar Gorge are a must. Keen walkers can enjoy the stunning views of the Mendip Hills and there are fishing opportunities at Blagdon and Chew lakes. This beautiful and spacious barn conversion is attached to the main farmhouse yet complete privacy is assured. On entering you will find the light and bright open-plan lounge/kitchen/diner. 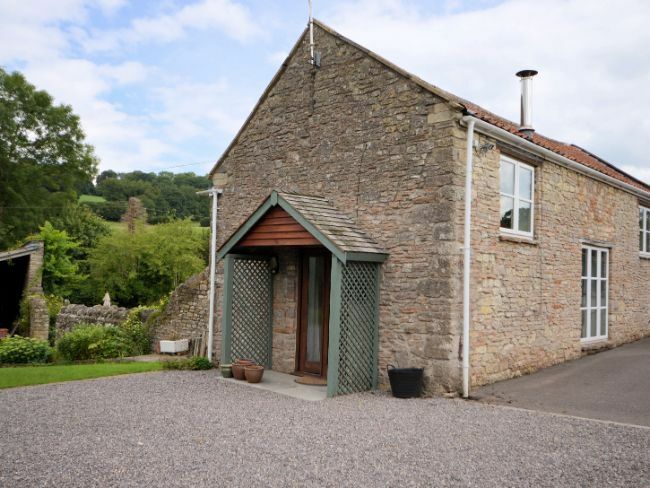 With features including a cosy wood burner and original beams this makes a fantastic base for your holiday. You can curl up and relax in the comfy and welcoming lounge which is equipped with TV/DVD and enjoy a meal in the charming dining area. The nearby kitchen is fully equipped with electric oven with hob microwave washing machine and fridge/freezer. Heading upstairs you will find the cosy galleried double bedroom which overlooks the main living area. Please note that there is a fairly low beam in this room. You will also find a bathroom complete with WC and shower over the bath. Heading outside guests are welcome to sit back and enjoy the pretty outdoor garden area which is shared with the other properties on-site. Off-road parking is available.